Adventure comes in all shapes and sizes. It can be dramatic or poetic—heart pounding or profound. It can be all of the above or something totally and completely unexpected. And sometimes, it’s just the simple things. This week, we found adventure far away from the heavy offshore blue water sailing that we’ve been experiencing.. The Bay of Biscay is located somewhere at the corner of your wildest dream-come-true and your worst possible nightmare. You dread it, and you look forward to it—all at the same time. As it approaches, anticipation sets in. Then your excitement competes heavily with your fear..
It’s been exactly one month since we set sail on August 19, 2018 on our 6,000 nautical mile sailing journey from Stralsund, Germany to Gulf Shores, Alabama. We battled The Baltic, survived The North Sea, and sailed through The English Channel on our way into The Northern Atlantic. First, let me make one thing clear…. You don’t just wake up one day and say, “Hey, I think I’ll sail across the Atlantic Ocean today.” It takes months and months and months of planning and preparation. The hardest part is making the decision to go. Then it’s all about setting the date - which is a very strategic decision based on wind, weather, currents, tradewinds, Hurricane season, work schedules, and more. After that, it’s just organization and details. Simple, right? Well, I’m talking about miles of supplies, mounds of paperwork, and multi-megabites of details! I’m a detail person, however this level of detail has my head spinning—but in a cool, groovy, ready-for-the-adventure kind of way. For the past eight months we have been planning and preparing for the adventure of bringing our 43-foot, steel-hull, Dutch-designed, ketch SEEFALKE from it’s home port in Stralsund, Germany to its new home base in Gulf Shores, Alabama, USA. This is a 6,000-plus nautical mile journey that will take us to ports in more than 12 countries and require navigating the challenge of at least eight major bodies of water. We’ll start in the Baltic Sea and travel to Bon Secour Bay, by way of the Atlantic and the Gulf of Mexico. We are not full-time cruisers, so we will have to work while sailing. This requires getting about six-to-eight months worth of work completed in advance, like . . . NOW. . . and finding a way to work as we sail. This may require taking some breaks to moor the boat and do some traveling for work. We have padded our itinerary accordingly. We will also need to outrun the Baltic and North Sea winter, navigate the traffic of the English Channel (the world’s busiest shipping area), and face the challenging wind and waves of the Bay of Biscay before we ever even get to the Canary Islands where we hope to catch the tradewinds across the Atlantic. Of course, we need to also avoid Hurricane Season. I have never dreamed of the complexity of this level of fine lines, excel spreadsheets, and checklists. I’ll be the first to admit, it’s been extraordinarily overwhelming at times. But we forge ahead in search of this grand adventure. 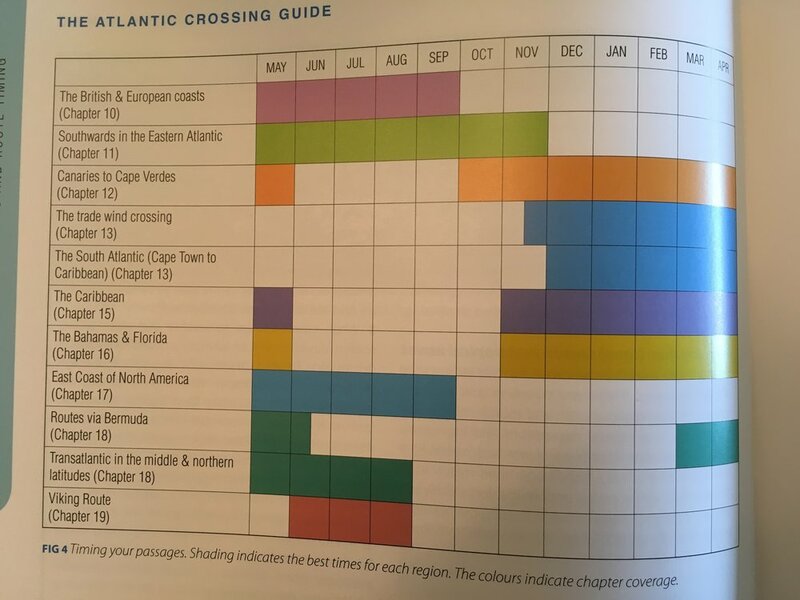 Our greatest resource has been The Atlantic Crossing Guide, by Jane Russell (Adlard Coles; 7 edition (February 27, 2018). And it did not go unnoticed by me that in the introduction, Russell describes experiencing eight straight days of seasickness while crossing the Bay of Biscay. So we have THAT to look forward to. You can order this fantastic reference on Amazon by following this link. We are using many other resource books. Maik is diving into the more technical references—he is a German who prefers just the facts. I am busy reading the entire works of my sailing idol, Lin Pardey. My favorite of her books is Storm Tactics Handbook: Modern Methods of Heaving-to for Survival in Extreme Conditions, 3rd Edition (Pardey Books; 3rd edition, July 1, 2018). This is also available on Amazon by following this link. I am happy to introduce you to our cast of characters. Let me start by saying that I’m the novice. I’ve only been sailing for five years. I’ve logged most of my nautical miles on The Baltic Sea on TOJA, a 24-foot Flying Tramp. I’ve spent a lot of time in the past two years on our small, wooden, day sailer, PROTAGONIST, but I’ve never experienced a journey like this. Still, I’ll be the narrator guiding you through the process as I guide myself. We will learn together along the way. Maik is the more experienced sailor and our very seaworthy captain. A veteran of the German Navy, he has been sailing for more than 20 years with many solo sails on challenging waters in his logbook. Our main character is our sailing vessel, SEEFALKE. With her steel construction and long keel, she was built for a journey like this. And then there is our crew—our two Seadogs, Cap’n Jack Sparrow and Scout. 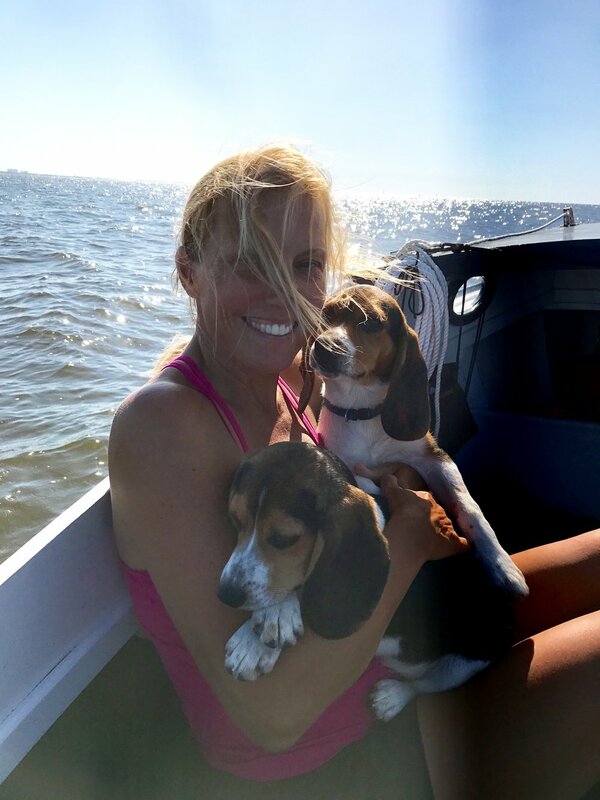 Our beagles have been sailing since they were four months old, and we would not consider taking this journey without them. Maik and I have been dreaming of a trip like this since we met five years ago. But it wasn’t until about eight months ago that we finally made the decision to go for it and set the date. We plan to set sail on August 1, 2018. Of course, this is the goal, but there are a few details to take care of before then. Let me emphasize that first and foremost, the most important part of the planning is making sure the vessel is SAFE and ready to sail. The creature comforts are secondary and not even all that important really. Safety is the name of the game. If the boat is safe, we will launch. The good news is that the first several months will be spent on the Germany/Denmark/Netherlands/United Kingdom coasts and along the European Atlantic coast. This means we will be close to ports where we can get spare parts, service the boat if needed, make repairs, and collect provisions. We have focused on making sure the hull and engine are in good shape. We are having the entire electrical system overhauled, retrofitting the vessel with wind and solar power, and securing all appropriate licenses, certifications, safety checks, weather and navigation equipment, communication equipment, and all the technical details that will make the boat and the crew SAFE to make the journey. We made a decision about a month ago that we cannot possibly make this journey without our Seadogs—Cap’n Jack Sparrow and Scout. Our beagles will be about 18 months old when we set sail, and we just can’t imagine leaving them behind for six to eight months. They are great sailors and love being on the water. It’s a no brainer. But this decision has added a massive amount of details to the planning. First, they must cross the Atlantic by air—we have to get them from Gulf Shores, Alabama to Germany. I originally thought we could just call an airline and book a couple of pup tickets. Easy, right? People do it all the time. My bubble was burst very quickly. Airlines don’t do this anymore. Trust me. I called ALL of them. I learned quickly that for a dog to travel overseas on any airline, you must employ the services of an IPATA-approved pet carrier. This is now a requirement on ALL airlines. There are many capable carriers, and we found a fantastic one—Pet Air Carrier, of Alpharetta, Georgia. Since we are taking a direct flight from Atlanta to Frankfurt, I liked the idea of having a service that is local. These guys are helping us with every detail. They are helping us secure all the appropriate paperwork and even helped us correctly measure the size of our airline-approved pet carriers. We ordered nice ones from Petmate, and are already working to help the beagles to get comfortable with them. You can order one from Amazon by following this link. We are working with our regular veterinarian, Dr. Niesje Langston of Magnolia by the Gulf Animal Clinic in Gulf Shores, to secure the proper USDA-stamped health certificate, microchip, rabies vaccination, rabies titer, flea and tick treatment, heartworm treatment, and all the other appropriate pup details. She is even helping us to create a doggie first-aid kit. Pet Air Carrier will meet us at the airport in Atlanta and make sure the pups are checked in and secured correctly. They also arrange to have a pet customs broker help us out when we arrive in Frankfurt. I am much more nervous about transporting the Seadogs by air than by sea, although the sea details are also long and laborious. We are using Lufthansa as our airline, and I’ve been informed they have a fabulous Pet Lounge. They are famous for making safe and comfortable transports for canine family members. I’ve been told that unless I’m flying business class (which I’m NOT), then the pups will be more comfortable than me. This makes me feel a little bit better. Once we get them to Europe by air, the European part of our adventure should be relatively hassle free. The European Union is very pet friendly. You can bring pets on trains, and most public transport, and they are even welcome in most shops and restaurants. Still, each port will have some requirements, like the microchip, rabies vaccination, and health certificate as a minimum. We also will acquire a European Pet Passport. We pulled information from multiple online resources, including www.bringfido.com and individual country tourism websites to create a massive chart detailing all the requirements for all the countries we may be visiting. We have been researching a lot about how to keep our furry friends comfortable on board. Here are just a few fantastic articles from our research. We have pulled essential tips from all of these and other articles. The bigger obstacles will come when we cross the Atlantic and enter the Caribbean Islands. This is where the requirements get stringent for animals. The last thing we want to happen is for the dogs to have to be placed in quarantine. Therefore, we are hiring customs brokers in Barbados and the Bahamas, and any islands that have stricter requirements than that, well, we will simply avoid. We will be writing a LOT more about cruising with dogs throughout our journey. So stay tuned for the finer details of making long passages with canine family members on board. In the meantime, Maik and I will be updating our vaccinations and acquiring appropriate visas. I'm starting to think about the clothes I'll bring for extreme cold and extreme heat conditions. I have my tiny, Navy-issue sailor’s duffel bag that we bought from the local military surplus store. Maik says I can bring anything on board that I can fit into this bag, so I’m busy perfecting my folding and stuffing skills. I have also been researching a lot about rationing fresh water supply and how to manage trash on board. Stay tuned for these blogs, coming soon. The bottom line is that the detail planning includes the boat, the pups, and the people—in that order. Planning a passage like this is kind of like having a baby. You have to plan and prepare for the details, and the budget. And just like having a baby, most humans can’t just plan for and finance something like this in one shot. We have had to strategically budget and plan over a very long period of time. But just like having a baby, if you wait until you are completely ready, have all the money you need, and have everything in order that you may possibly need, you will never do it. Our advice is to spread the budget over many months, or even years, as we have, and focus the planning on the most important element—SAFETY. The rest should fall in line as you go. And just like having a baby, the rewards will tremendously outweigh the preparation required.